In case you’re interested, here’s our comparison from last year. Businesses always look for the best bang for their buck. That's how SMS has stood the test of time. It's the most effective mobile marketing tool from a performance, flexibility, convenience, and cost perspective. Most businesses will look at cost as the defining factor—but time is an equally if not more valuable resource. 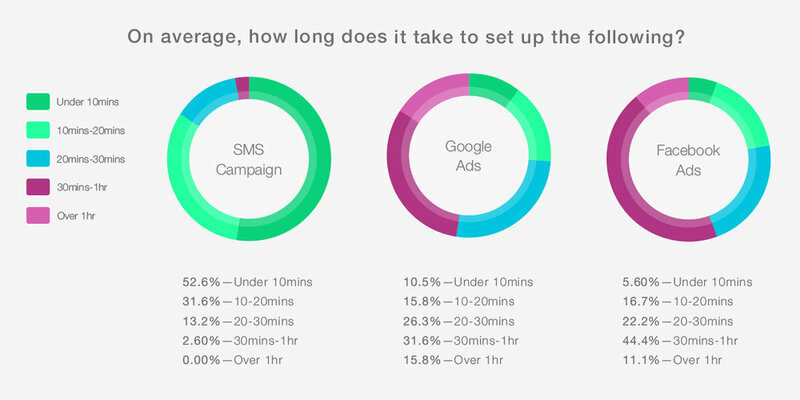 In a recent Burst SMS survey, many respondents (52.6%) reported that it typically takes them under 10 minutes to set up an SMS campaign. But when it came to Facebook Ads or Google Adwords, half of them said that it takes them over 30 minutes to set up a campaign (47.4% and 55.5% respectively). All it takes is a 160 characters (or less) to create an SMS marketing campaign. Want more SMS or mobile statistics like this? Indulge in our 2018-19 State of SMS. Click the button below to download. It's free.